Holy Cross Seminary is a seminary of the Society of Saint Pius X, for English speaking candidates to the priesthood and religious brotherhood from Oceania, Asia, and Africa. It was established in 1988 and is located in the countryside 25 kilometres outside of Goulburn, about 2 hours driving time south-west from Sydney, Australia. The special purpose of the Society of Saint Pius X is the priesthood, and everything that concerns the priesthood. Consequently, the formation of priests in the Society's Seminaries is the chief and most important work it accomplishes. 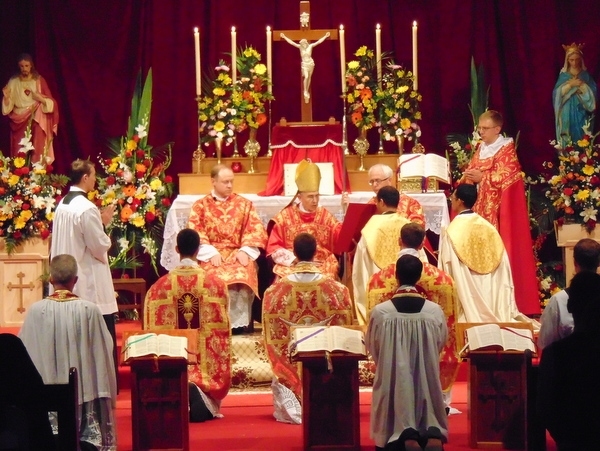 It strives to form true priests in perfect fidelity to the tradition of the Roman Catholic Church, in all of its aspects: doctrine, liturgy, retreats, spiritual life, daily prayer and so on. The purpose of priestly formation is to convert the seminarian into another Christ. The life of prayer, the studies, the work, and the recreation at the seminary complement one another mutually in such a way that the seminarian is able to identify himself with Christ. The seminarians are in the seminary in order to prepare a eternal life for themselves and for all those to whom they will be sent. This eternal life consist in knowing God in the one he sent, our Lord Jesus Christ (Jn. 17:3). That is why our Lord Jesus Christ is the object of all of their studies and of all of their efforts in the seminary. During their years in the seminary, the seminarians have the ineffable grace of living under the same roof as our Lord Jesus Christ. They can therefore draw near to him as Mary and Joseph did, in the silence, recollection and spirit of prayer which ought to reign in the seminary. In their prayer, in the music of the liturgy, in all the ceremonies, they are always learning to know and to love him a little bit more. They draw closer to him especially by the sacraments which they receive, the sacrament of penance and the sacrament of the Eucharist. The reason they are drawing closer to our Lord Jesus Christ is so that they will be able to bring him to the world. They are called to be missionaries by their very nature, by their essence, because the priest brings him who is the light of our mind, the warmth of our heart and the inspiration of our will. They not only have to require a knowledge and a profound faith in our Lord Jesus Christ – “the only salvation of the world”, as the old man Simeon declared (Lk. 2:30) – but they also have to warm their hearts by the charity of our Lord Jesus Christ. This charity is acquired by steadfast effort and by continual prayer to our Lord. We cannot hope to receive all the graces which are going to transform us in the charity of our Lord if we do not pray and meditate and ask our Lord Jesus Christ for them. Archbishop Marcel Lefebvre, Priestly Holiness, pp. 62-64. Holy Cross is not just a Major Seminary. It is also a Brothers' Novitiate, for those men who are willing to sacrifice all to follow Christ and seek for perfection. Formation in the practice of the vows, the religious and community life, generosity and prayer are the main elements to be achieved during the novitiate. After their novitiate, the Brothers remain to learn the invaluable practical skills that enable a brother to serve the Society most effectively. The religious life, exemplified by the Brothers, is crucial to the life of the Society and to that of Holy Cross Seminary.